Carbuzzzn would like to invite you to be a part of the Gold Coast, family-fun charity event to raise money for the charity LIVIN. 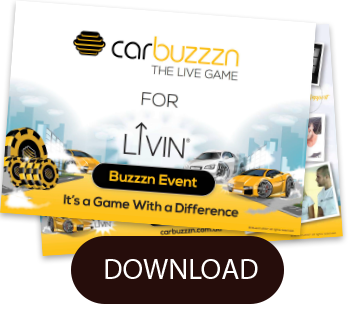 This event is based on Carbuzzzn the car racing game, however, this is a live game, think bubble soccer meets bull rush! The highest scoring team gets the inaugural Buzzzn for LIVIN trophy and bragging rights for being the best demolition team in Australia! Please register via the form just here on this web page and Carbuzzzn will be in contact with you. The event is a knockout competition. There are 2-minute rounds to score as many points as possible for your team! Make it through the intersection safely to score points. Try not to get cleaned up! If you do, you’ll score zero points for that run through – but get up and go for it again! The team with the highest score after 2 minutes wins the round and progresses on until we have an ultimate champion team! As well as lots of shade from this Summer heat! Find us down on the GREAT LAWN on the Broadwater Parklands – you won’t miss the bubble soccer, jumping castle, food trucks and supercars! 100% of monies raised from the entry fees from team sponsors will be donated directly to LIVIN and there will be many alternatives to donate to LIVIN on the day. Please join us in CELEBRATING this free event creating fun for kids and we hope you ENJOY the event and we hope to bring many more in the future.